Football Manager 2013 was Sports Interactive’s big push to accommodate a neglected yet growing part of their audience: the no-longer-young men without the luxury of managing their squads through the wee hours like they used to. For them, SI built Football Manager Classic – a liposuctioned remix of the full-fat FM experience – and in-game microtransactions that would allow players a shortcut when faced with a long grind toward promotion. SI head Miles Jacobson told us that the latter in particular have proven to be spectacularly popular. 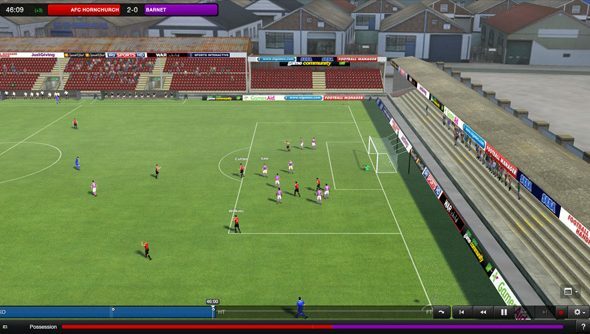 Jacobson revealed that while there was less demand for FM13’s new Challenge mode than SI were expecting (“There’s so much content in the game already.”), selling cheats turned out to be surprisingly good business for the developers. About 10% of Football Manager 2013 players have jumped into Classic mode to date – though as Jacobson notes, that’s no small statistic. “We haven’t been secretive about sales figures this year, we’re 20% up year on year, which means we’ve done about 1.2million – so ten percent of people is 120,000 people – it’s around 105,000 people who are actually playing Football Manager Classic,” he said. When you play Football Manager – as we know tens of thousands do, every day – do you head straight for the meaty campaign option, or enjoy a more manageable panini in Classic mode? What about those paid-for boosts? How do they fit into your time with the game?